My honey has been asking for this for years. Don't know why I never got around to it because these are really good! He used to enjoy the Sonic breakfast burrito. 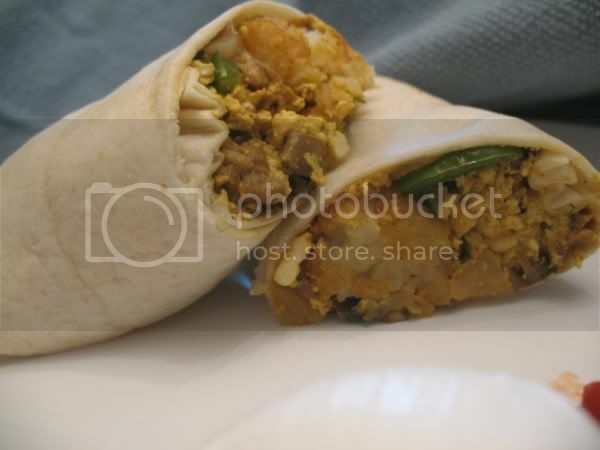 This is an homage to fast food burritos, but without as much fat, and without the animals. The recipe has a couple components, but you can make several burritos, so you get a lot out of your effort. -Use your favorite tofu scramble that uses one block/1 lb tofu(I used VWAV), adding Follow Your Heart Jack cheese/other vegan cheese if you want. -For a bit of a greasy factor, saute onion and pepper in some Earth Balance. Microwave or put over the burner the tortilla. It makes it pliable. 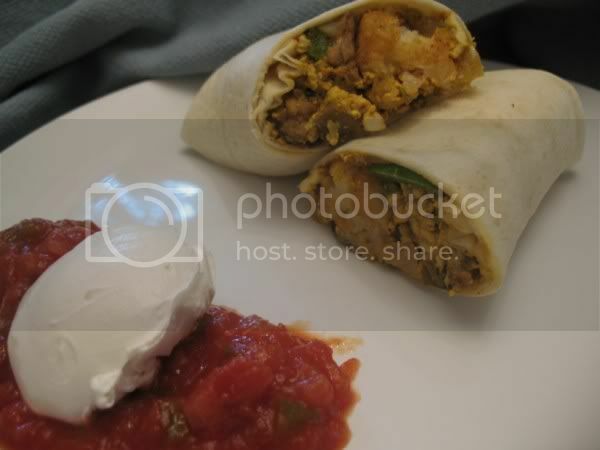 Fill with tofu scramble, onions/peppers, sausage, and tots and roll up- sides first, then roll up. I like salsa and vegan sour cream. Don't forget..you can add jalapenos, olives, hot sauce, whatever you want. Does Sonic really sell burritos with tater tots in them? I had no idea ... Despite what seems quite odd to me, those look really good! You had me at tots! I love the tater tot idea, genius! These look amazing.